Colts' 10th place score of 86.15 at the 2007 DCI World Championships was just 0.15 and one position under the corps' highest finish ever. Some fans may have been intrigued during the pre-season to wonder how the disparate repertoire selections could fit together to fit the theme, "Equinox." Andrew Lloyd Webber's "With One Look" (from "Sunset Boulevard") was followed by Mussorgsky's "Coronation Scene" from "Boris Godunov" and Prokofiev's "Troika" from "Lieutenant Kije." Then Bartok made it into the mix with "String Quartet No. 4, Mvt. 5, Allegro Molto," with "As If We Never Said Goodbye" from "Sunset Boulevard" wrapping up the production. It was easily one of the most diverse repertoires ever put into one show. However, it made sense when one realizes the different selections reflected the personalities of the changing seasons, perhaps harkening back to the corps' "Iowa's Four Seasons" show in 1993, the first of eight years the corps made it into the World Championship Finals. More specifically, the show was about the vernal and autumnal equinoxes, the two times of the year when the sun crosses the Equator and the hours of daylight and darkness are of the same length. "With One Look" opened with the color guard under full body-wrapping gold-fringed purple capes that represented the colors of falling leaves. Saved for the big hit that came over a minute into the show, flags the colors of orange, gold, yellow and red were picked up off the field. The spinning was akin to the sight of falling leaves blowing in the brisk autumn wind. A female guard member in a white headdress and long flowing white skirt interacted with the male guard soloist, her stark white palette suggesting the snow to follow. The rest of the guard soon followed in pure white, although their costumes were not as elaborate. Performance excerpt of the 2007 Colts. Flags turned to an image of one-quarter of a white stylized snowflake on a light blue backdrop for the build-up to the fanfare of "Coronation Scene," leading into "Troika." This playful piece slipped into a brief jazz segment, celebrating winter's frolicsome fun amidst the frozen hibernation of much of nature under the snow. The Bartok piece demonstrated that the coming of winter right after the autumnal equinox was not always welcoming. The female guard soloist donned a black headdress and a black skirt under tattered white strips while the entire guard picked up black and gray flags. Leading out of a percussion feature, the melody was largely angular and angry, the brass players collapsing into a rotating eight-pronged asterisk snowflake. The brass music was especially biting and blunt, like a wintry gust of frigid air making one's bones shudder. 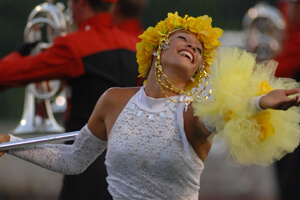 At the beginning of the light samba rendition of "As If We Never Said Goodbye," the female guard soloist replaced her long black skirt with a long yellow one, the color of many of springtime's earliest flowers. Flags with bright yellow balls of the sun and shooting sunrays were soon joined by yellow and pastel purple flags backfield. Indeed, few corps have known how to milk a classic ballad like the Colts. The guard soloist picked up a flag of bright yellow flower petals to match her yellow headdress, and with the snow all melted and nature coming alive after the frozen winter, the cycle of the equinoxes was complete, ready to start all over again. This week only, you can save on 2007 World Championship Audio and Video Performance Downloads on the DCI Fan Network. Buy the 2007 Colts Video Performance Download. (Available this week only for $3.99. Regular price: $4.99.) Buy the Audio Performance Download bundle of all 12 Finalists from 2007. (Available this week only for $15.99. Regular price: $19.99.) Offer ends Monday, Dec. 5 at 8:30 a.m. ET.